Less is more: Propaganda on propaganda? Double good newspeak! Time was the Wall Street Journal had a respectable reputation. It was a publication of the capitalist empire, but still had a reliable objectivity to its content: like on Dragnet - "Just the facts, please." Then came Murdoch and his acquisition of the paper. We all feared that editorial slant would affect the content of WSJ to match Murdoch's views - but we kept hoping for the best. But Murdoch cleverly promised the editors expanded space for the news and editorial articles; however, we did not know the 'quid pro quo' for this - until now. We do however know that Murdoch altered the prudent guidance of the FCC for the growth of his own media empire: full story here. 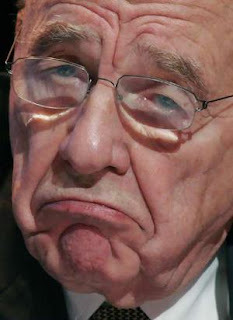 Is anyone surprised that Murdoch is a Zionist? 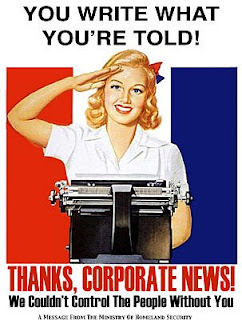 Who does not know that the US media is the most biased and controlled media in the world, effectively creating a world view for its citizens of 'US, the good guys' and 'THEM, the bad guys'? The answer is many Americans themselves indeed do not have a clue about this. Now we have this slanted journalism coming out of the WSJ which is infested with bias, a true propaganda piece, accusing the Chinese of propaganda! Go figure...it is all a propaganda war out there. Hail to those who still seek the truth through the convoluted tactics of mainstream media. China is about to embark on a multibillion dollar media expansion overseas, including the establishment of a 24-hour English language all-news channel modeled after CNN. These are only the most recent steps in a methodical strategy for Chinese state media to "go global" and make "the voice of China better heard in international affairs" -- a plan set in motion by President Hu Jintao immediately after his accession to power in 2002. Since then, Chinese state broadcasters have considerably strengthened their foreign news operations, enhanced foreign language services and established the supporting bureaucracy to get the government's message out swiftly when news breaks. The sheer scale of these plans raises many questions about China's long-term objectives. Can state-run broadcasters, whose traditional role is to be the "throat and tongue" of the Communist Party, really turn into competitors for the likes of CNN and the BBC? Or could China's quest for international audiences lead to a loosening of the tight censorship rules that continue to straightjacket its reporting? There is, after all, something natural in the aspiration of a rising global power to match its newly acquired economic might with a corresponding increase in its "soft" power, and its growing involvement in world affairs with a bigger voice in the international arena. Many governments do just that with state-sponsored broadcasting, like Voice of America or Germany's Deutsche Welle. So what's different with China? The difference lies in the strong control the Chinese government and Chinese Communist Party exert over news and information. Sure, in recent years China Central Television (CCTV) and even the People's Daily look slicker, more contemporary and less political than in the past. But this has not changed the fundamental premise that all information on state-run channels must reflect the government's views. This is no surprise. The state itself refers to all media work abroad as wai xuan, or "external propaganda." On its official Web site -- but only in Chinese -- CCTV describes itself as "the mouthpiece of the Party and the government," lists its main operations under the heading "propaganda situation," and refers to its new foreign language channels as "reaching a new stage in external propaganda." Xinhua -- a self-depicted "news agency with Chinese characteristics" -- describes its activities as "conducted from start to finish under the direct leadership of the central party authorities." Its current director is the vice-chair of the Central Committee's propaganda department. For the Party, propaganda is not a degraded form of information -- it is information. None of this context appears in the English language versions of these Web sites. This is not to say that there is no quality journalism in China. Over the past 20 years the marketization of the Chinese media industry has led to an explosion in the number of "commercial" newspapers, magazines, Internet information portals and radio and television stations. Although they remain controlled by the government through a combination of ownership, licensing and administrative shackles, many companies have discovered that hard news is the best way to attract an audience. Faced with fierce competition, the Party has responded by giving more leeway to the most prominent state-run organs and encouraging the adoption of Western-style media marketing techniques. Even CCTV now has an excellent Chinese-language investigative program called "News Probe," which has broadcast stories on subjects such as AIDS orphans, pollution, land grabs and corruption. However, these programs have not made their way to the wai xuan media. English-language news from China is not about informing the foreign public; it is about channeling a specific view of China to the rest of the world. The Party's information management is based on the principle of neiwai butong, or "domestic and overseas differ." Beijing's 45 billion yuan investment will be geared mainly to sprucing up these outlets for foreign viewers, but the fundamental mission won't change. It's not just English-language viewers who will receive this polished view of China. In addition to the forthcoming "Chinese CNN," CCTV recently added French- and Spanish-language broadcasts and has plans to launch Arabic and Russian channels this year. While American networks are slashing their overseas operations, state-owned Xinhua news agency is considering expanding its overseas bureaus to 186 from 100. Beijing might be right in thinking that improved "external propaganda" will provide an additional weapon to fight back against its critics, but ultimately it will come at the expense of something far more important: the soft and persuasive power that can only come with a free, unbiased media that informs rather than misleads. Mr. Bequelin is a senior researcher at the Asia division of Human Rights Watch.